Before setting out, ask yourself this: What is this room designed for? Beyond the obvious utilities - to cook, to sleep - how to you want to feel in this space? What mood will be invoked when you open the door and step inside? For example, a kitchen can be a bright space used to bring the family together, or for an amateur chef a work space and studio. While both are used for cooking, the mood is completely different, which should flow through the features and design. Traffic, or the frequency of use, must also be considered. Certain materials are better than others and may suit different spaces to ensure your rug is long lasting and maintains its beauty. You can read our blog: Silk, Wool or Viscose? here for a good overview on options. Finally, measure out your space. For most spaces, a too-small rug means the furniture "floats" - a properly placed rug should be large enough to encompass all furniture involved in the space. For example, a lounge room rug may have the lounge, side table and two armchairs on the rug, but not include the sideboard as this is occasional furniture and not part of the zone. If you can't afford or find the right size, at least ensure the front legs of your furniture is on the rug to "anchor" the pieces together, or you have enough space to have all pieces away from the rug. 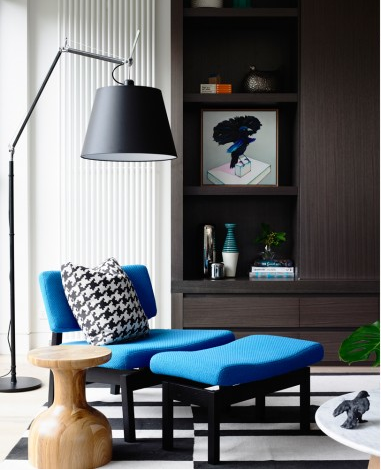 The monotone Abstract Lines rug allows the electric blue of this feature arm chair to remain the focus of the room while complimenting the Houndstooth pattern pillow. The colours and textures across your space dictate not only what the room is utilised for, but is one of the first influences on the mood of the room. Colour theory has been studied across the centuries, showing how colour can dictate mood, focus and even raise or lower our blood pressure! You can find our comprehensive Blog on Colour Theory here. Conduct a "room audit" and look for what colours and textures are across the space, paying attention to things like skirting boards and wallpaper, as well as the soft furnishings you'll be keeping in your design, such as curtains and throw rugs. Furniture accents can be a great way to tie your rug into your design without being matchy-matchy and overwhelming. The brass pulls on a coffee table, the chrome feet on the tv unit, or the American Walnut finish of your bookcase all offer colour opportunities to tie in or focus in your rug. Beyond colour, the texture and pattern of your rug is the eye catching moment for your new investment. While you might be tempted to choose plain or classic designs, don't shy away from exploring a modern rug design, or styles that are twists on old favourites, such as the distressed rug trend. Discovering an unexpected rug design offers a whole new sense of individuality to your space, and can become a new focal point to your room design. With our full range of modern rug designs, and our customisation options, including colours and sizes, we are committed to assisting you in finding the perfect piece to add to your space. Contact us to discuss your needs, or peruse our range of rugs here to begin your journey. Rescuing the neutral tones of this design from looking too plain, the inclusion of the Herringbone rug and a pop of yellow adds personality and freshness to this room.